Located by the bank of River Ill, the stadium in eastern French city of Mulhouse was built in 1979. The field and 8-lane running track is surrounded with several-row sunken bowl of terracing. Above it there are two covered concrete grandstands. The west side, thanks to all sporting facilities being hidden beneath it, is considered the main one, also being the first one to become an all-seated area. 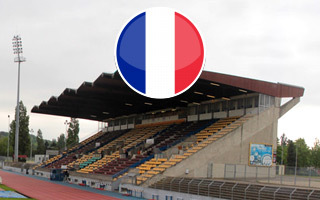 The stadium is primarily used for football by FC Mulhouse, though it’s also the city’s main training facility and the site of numerous sporting events. It may just be the most historically-significant stadium throughout the Paris metropolitan area, even if much forgotten nowadays. Opened in 1909, Stade Bauer wasn’t only home to Red Star FC. The ground also played the role of de facto national stadium between 1911 and 1914, later also sheltering Paris St-Germain in 1971-1972 during their Parc des Princes’ reconstruction. In its early decades the stadium and it key hosts were among the most important in French football. Red Star may have not won any French championship, but between 1921 and 1942 they won five French Cups. No wonder that in 1947, just after WWII, the building grew to its peak size of 23,000. Commonly considered English-alike, the ground had ‘shed’ cover throughout its history over at least part of the terracing, as well as providing a rather compact, intimate football environment. Opened against the London-based Old Westminsters FC, then home to games against English giants like Tottenham, the stadium also has its name rooted in English tradition of naming grounds by the street they’re built near. Stade Bauer recognizes Jean-Claude Bauer, French resistance hero who has his street and statue nearby. The last major revamp of the stadium took place in 1975, when the north-east terrace was built, while the south-west end demolished to make way for a very distinctive residential building. By the time Red Star entered the 21st century, the stadium had already been severely underfunded. In fact, in 2006 part of the structure collapsed, resulting in all roof from the east stand removed and the stand being sealed off entirely, only except for a small away section. No wonder that upon Red Star’s promotion to Ligue 2 in 2015 the club could not hold home games at Stade Bauer, had to relocate outside Paris first and then to Stade Jean Bouin.